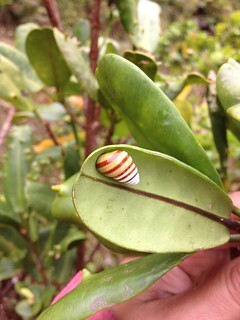 Endangered Tree snails persist in a variety of habitats. Of the 40-something species that used to exist, only 9 species remain on Oahu and none of those are anything close to widespread. Feral goats have destroyed a lot of the suitable habitat that used to exist in the Waianae Mountains but judicious fencing of remaining patches of native forest can make a big difference. 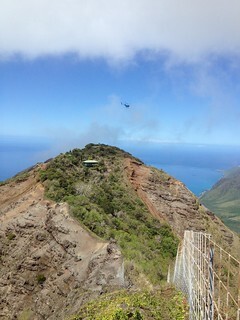 Ohikilolo ridge (below) has flourished under 20 years of management. The valley has been fenced, native plants have been out-planted, rats have been controlled, goats have been killed. It's a lot of work and it's not just for the snails. There are a lot of rare plants in this habitat, rare birds, dragonflies. 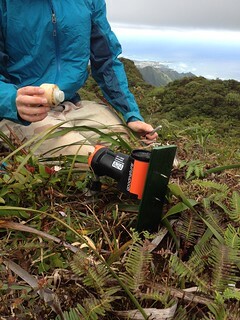 Last time I was there we counted over 400 endangered snails (in 31 person-hours of searching). It was a pretty awesome little ecosystem. Sometimes we need better fences- fences that keep out not only goats but things like rats, big chameleons, and other (cannibal) snails. 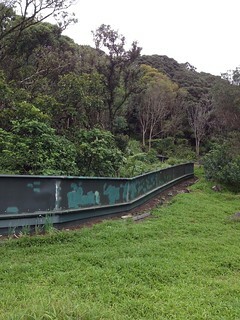 This fence (below) protects a nice patch of native forest and incorporates at least 4 lines of defense against potential invaders. Other places are harder to get to and not so friendly to fence building so we employ other tools to manage predators. This (below) is the cutting edge of rat trap technology. These traps (from NewZealand) can humanely kill up to 24 rats before needing to be re-set- they use a compressed air cartridge to automatically re-set the metal bar that delivers a fatal blow less than half a second after the rat moves the hair trigger to sniff the bait. We don't have to worry about carcasses building up because there are a number of animals in the forests that will gladly drag away a fresh rat carcass. This includes other rats. I am looking forward to getting back out to do some chameleon searches in the next few weeks. We've got a lot going on. Until then, I leave you with a little snail.